Phew. I’m finally done setting up my planner this year. As I’ve previously mentioned, I intended my 2016 planner to be the Kate Spade Wellesley but alas I didn’t get on with it and decided to stay in my Patent Fuchsia instead. I moved into the Original late last year after finding the Ban.do planner much too big for me. Because it was a last minute move, I didn’t really set it up too much in terms of my sections. The only thing I really changed was adding in a finance section in November to help track my spending. 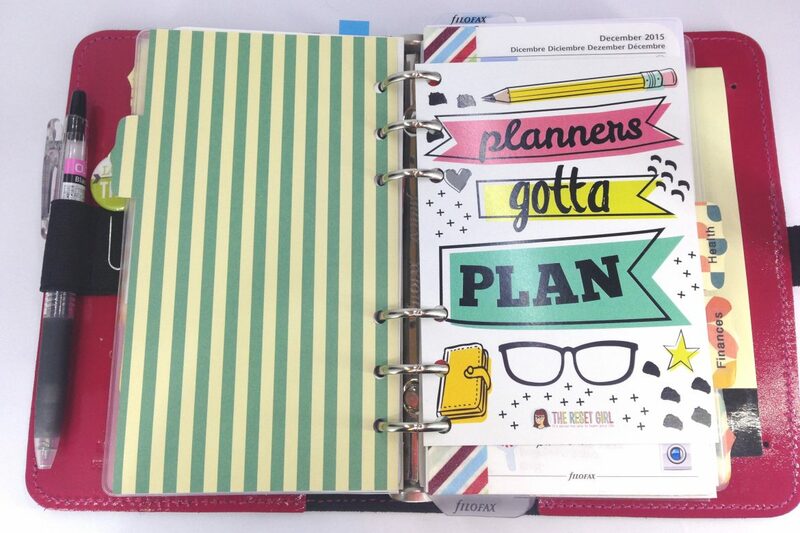 As I was making the decision to be in this planner from the beginning of the year I really thought about what I needed in a planner to make me more organised in 2016 and help me reach my goals. At this point I really need to give a shout out to Rachel Dunaway. Her 2016 set up video was a massive inspiration and the first in a whole line of set up videos I binge watched for some inspiration. My first page is my 2016 goals that I shared last week, followed by the detailed pages of how I’m going to achieve them. I’ve also put a Project Life card with some washi on just in case I need some on the go. After the goals I have my year at a glance page from Just So Stationery that I use to pop holidays and events in. Next I have my Webster’s Pages inserts that I use to plan my month out on in terms of general to dos and anything I need to achieve in relation to my yearly goals. Next up is my planner section and it starts which this rather perfect card that was a freebie from The Reset Girl! The inserts I’m using this year are from Just So Stationery and I talk about them more in this week’s ‘my week‘ post and I love them! Next is my ‘health’ section which is a little underdeveloped right now but it starts with this page which is basically my health goals for the year. I intend to do fitness challenges each month of the year and here is where I’ll make a note of what I’m doing. After this I have some more year at a glance Just So Stationery inserts where I track my daily challenge results, weigh ins and any exercise I complete. Also in my health section is cleaning. You may think that it’s a bit random to put that with health but I didn’t really want two separate small sections for health and cleaning and it felt that they kind of go together somehow? A clean flat means a healthier me maybe? I made these inserts myself using my Silhouette (because I hate cutting down my own paper/card). It was a first attempt and has come out a little big but it does the job of helping me track all my weekly cleaning ‘must dos’. Next is my finance section which is currently filled with all my salary and spending details! But it hasn’t changed since last year so if you want to see the set up then click here. The only change is I now use a Filofax ruler to mark the spending tracker page I’m on. Instead here is the folder and pockets I have in that section to hold vouchers, cards and receipts. The final section is my notes section and I’ve taken a lot of inspiration here from Rachel as this was the section that was least working for me last year and there was so much I wasn’t writing down and missing because I didn’t really have anywhere to put it! The first page is my brain dump and this is intended to replace the random sticky notes I have around my desk. In this section I then have separate pages for to do’s, shopping list (which is what the sticky tab you can see is on), reading list and movies to watch.